Bye everyone. See you in 6 weeks. Maybe I'll get chance to blog while we're away. Hope so. Be ready for picture overload when I get back. In a week we will be going on another holiday adventure. This time we are going via a stop over in Singapore to Scotland for 12 days. Then to Amsterdam to board a river cruise for 15 days down the Rhine, Main and Danube rivers, passing through Holland, Germany, Austria, Slovakia and Hungry. Then we fly to Switzerland for 13 days travelling on trains. Then home via a Hong Kong stop over. Wow, am I getting excited? I finished work today and now to get ready for the trip. We picked up the travel documents last week. 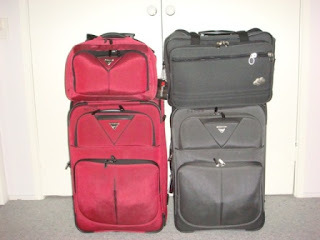 Air tickets, train tickets, hire car booking, hotel vouchers cruise booking. There's so much to look after and I'm so good at losing stuff. 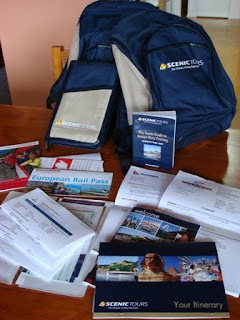 Scenic Tours gave us a back pack each and a document wallet.